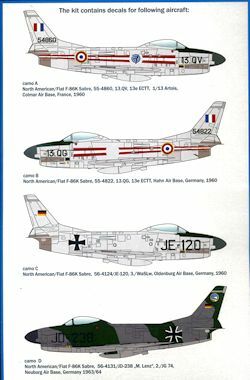 120 were built by North American and 221 kits for assembly by Fiat, North American model NA-222 (first 50 as F-86K-NF), NA-213 (F-86K-13 through K-19 blocks) and NA-221 (125 F-86K-NF assembled by Fiat) and NA-242 (final 45 F-86K-NF assembled by Fiat). Since the rockets were powerful, but really inaccurate, except for a short range firing against bombers, the NATO night interceptor units needed a different machine. It had MG-4 fire control system coupled with four 20 mm M-24A1, with 132 rpg each. It retained, despite being simpler, the same APG-37 "Sabre-dog" radar. 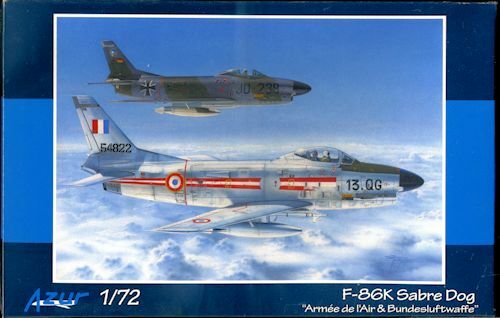 Many of us were hoping that someone would produce a version of the gun nose Sabre Dog and when Special Hobby issued its somewhat troubled F-86H, there were many who felt that the F-86K was not long in coming as it shared many of the same parts. Packaged in their usual letter box that few really like, the kit as well as the decals and photo etch and resin bits were in a pair or resealeble poly bags. I'm glad that many companies are using these as it allows one to fondle plastic without worries about losing pieces. 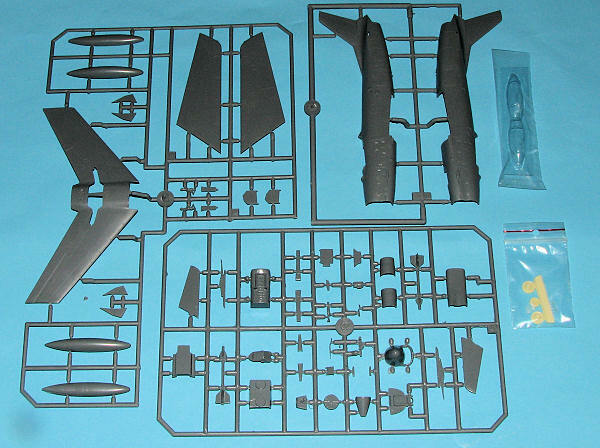 As expected, one of the three major sprues is a carry-over from the F-86H kit. This one has the wings and landing gear and drop tanks on it. A new sprue for the fuselage halves is given and I'm going to assume it has been properly lengthened to match the real aircraft. A third new sprue contains all the rest of the parts. This sprue has very slick plastic (as in shiny and looks wet). It also has a considerable amount of flash on it; especially on the smaller and more delicate parts. A few of the parts, like the cockpit tub, show definite flow lines so it will be interesting to see if these are visible under the paint. Couple of things of interest. First is that after the major boo-boo regarding the F-86H canopy, Special Hobby reverted to vac canopies for this one and they are the proper shape and design. Secondly, the photo etch fret includes the drop tank fin end plates that were missing from the F-86H kit. This fret also has color instrument and console panels, something I very much like to see. 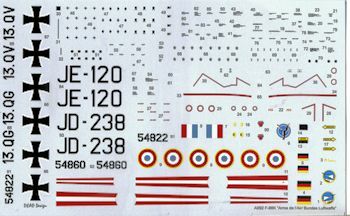 It also has the zillion small photo etch vortex generators that probably one in a thousand modelers will be able to actually install. As nice as those are, I'd rather have these molded on the stabs. Only one markings option is armed with Sidewinders. The wing for all of these is the long F-40 slatted wing. Since Special Hobby is also kitting an F-86L, you'll see all these bits save the fuselage halves in that boxing as well. Though not for the beginner, if one has several short run kits under one's belt, this one will make an excellent addition to any F-86 Sabre collection. Thanks to me for getting this one on sale.